These warning was presented by the Australian authorities. Despite these warnings given to 10,000 users in Australia, but there is the possibility of users around the world will be affected (especially for victims who did not feel his computer is infected). The cause of the internet access termination wasn’t came from solar storms, but due to a malware named DNSCharger. 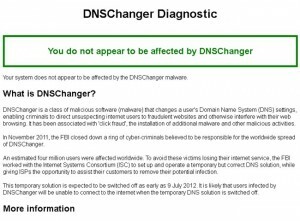 DNSCharger is malware (malicious program) which was created to attack the user’s computer by changing their DNS settings (Domain Name Server). As a result, all users access secretly diverted to another fake DNS server. This malware has infected an estimated 4 million users spread across the world. The FBI has take the action of an this incident and treat this individual act as a dangerous threat. This fake DNS server has already seized by FBI provide a temporary solution to this problem. Unfortunately if not handled soon, victims of DNSChanger will losing their internet connections on July 9, 2012 which means they will be experiences internet ‘death’. To assist victims by this malware attacks, the Australian government provides a website to scan the user’s computer at http://www.dns-ok.gov.au/. This website can also be used for users who lived outside Australia. For more information regarding treatment for those who are affected by this attacks, simply visit http://www.dns-ok.gov.au/ to get the latest information.